There are a lot of interesting, even amazing devices to be found in Las Vegas this week at CES. Add to that list the newly unveiled Switchblade, designed by Razer. 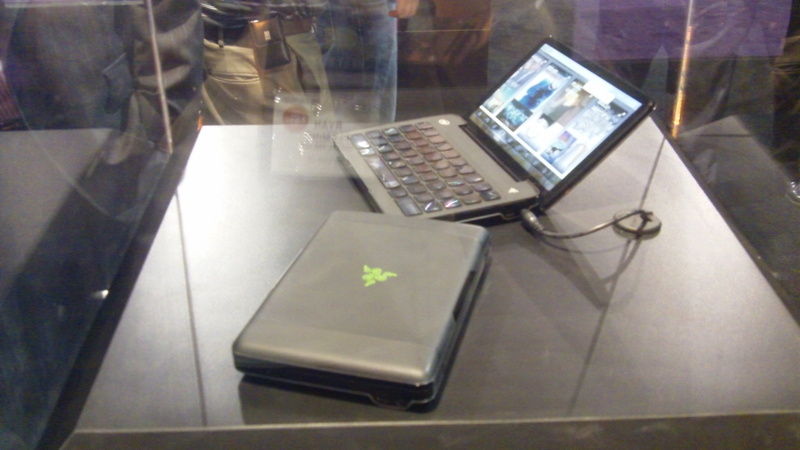 Razer has a long, and well earned reputation for making quality peripherals, specifically for the PC (although they are also set to debut a new set of products for the Xbox 360), but the Switchblade marks the first of this type of product for the company. In fact it marks the first time for this product from any company. The Switchblade is a mobile gaming device that is capable of running PC games, Windows 7, and is powered by Intel’s Atom processor. That is all impressive enough, especially when you see the size of the device (172mm x 115mm x 25 mm), but what really stands out is the keyboard—or perhaps more accurately, the keypad. One of the biggest issues facing mobile PC gamers has always been the mouse and keyboard. No matter how small the PC is, there is still a certain size required for a keyboard and mouse to be usable for a gamer. With the Switchblade, the keys are actually touch sensitive buttons that are displaying the images produced by the screen below them. So when a game is played, the device will map hotkeys to the locations you prefer, and on most games, they will be represented by an image rather than a letter or number. The Switchblade will also feature a mini-HDMI, USB 3.0, headphone, and mic ports, as well as 3G and Wi-Fi capabilities. This device is still listed as a concept, which means there are a lot of unanswered questions, like when will we see it in stores and how much will it cost. There are also technical questions still to be answered, including what kind of battery life can we expect, how the Atom will handle the graphics, and who will manufacture the device. Razer is stressing that this is still a concept product, and no definitive model has been approved yet–even the name “Switchblade” is just a temporary title. But the company does promise more information soon, so it is almost certainly a matter of if, and not when the Switchblade will be produced.